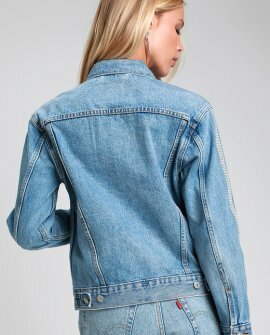 Turn up the luxe with the Levi's Ex Boyfriend Trucker Medium Wash Rhinestone Denim Jacket! 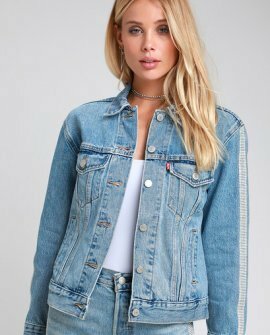 This perfectly oversized denim jacket boasts our favorite classic details: a structured collar, button pockets, and cuffs, front welted pockets and a full button placket. This jacket then takes it to a new level of luxe with rows of shinning clear rhinestones that create chic stripes down the sleeves! Adjustable sides and small red logo tag.